Country Light Candle Company is a family owned and operated business located in Central New York, in the small village of Chittenango. We specialize in natural candles and related accessories - tea light holders, votive holders, pillar plates, and unique tart burners. We have been making candles since 1997 and have had our online store since 2003. Our candles are made the old fashioned way - by hand, one at a time. We use 100% natural wax (Palm or Soy) to ensure a healthy, environmentally friendly glow. Our wicks are 100% cotton, no lead, zinc or metal of any kind. You will enjoy the true-to-life aroma of our candles due to the combination of the quality wax, wicking and our 100% undiluted fragrance and essential oils. Our eco-friendly dyes are specifically made for our waxes and, in the case of our popular Crystalline Palm Pillars, we tint very lightly or don't use any dye at all so the beautiful crystalline effect glows through. We are most famous for our 15 hour Premium Soy Votives and especially our 7 hour Premium Soy Tea Lights. These little cups of soy are our most popular item. Premium Soy Tea Lights will burn an average of 7 hours. We are fast becoming the premier supplier of long lasting tea lights for the restaurant, event planning and health spa industries throughout North America. Not to be outdone, our No-Stick Wax Tarts are made of 100% natural ingredients and will not stick to your burner! Just let them harden and slide them out. Many of our fragrances will last an amazing 12-36 hours per tart! We are sure you will love them and truly believe they are the best wax tart/melt on the market today. We also offer a large selection of quality tart burners, including electric melters. Oh and don't forget to browse through our entire on-line store and take a look at our candle accessories, gift ideas and decorative accents. We have hand selected each item to complement our Country Light candle line. So what are you waiting for? Turn off the lights, and enjoy the glow! "LIKE" Country Light Candle Company on Facebook for monthly drawing to win free candles and/or accessories! Subscribe to Country Light Candle's Monthly Newsletter for quarterly discount codes. This quarters discount code: FALLFRENZY12 for 12% off your entire order! Premium Soy Tea Lights are the best you will find! Hand-crafted with the finest natural ingredients, they will last an average of 7 hrs! *Dimensions: 1 1/2"dia x 3/4"h - made from crystal clear certified polycarbonate - visit Earth911.com for recycling info #7 plastic. *Unscented, natural white Premium Soy Tea Lights currently burn about 7 hrs 15 mins in our testing environment (sitting on a kitchen counter or on an indoor window sill not in a holder). Scented 25 pack, 50 pack, 100 pack, 400 pack. Country Light No-Stick Scented Wax Tarts are the longest lasting, heavily scented wax tarts available. Browse thru our wide selection of unique tart warmers. Kits include No-Stick Wax Tart & 7 Hr Soy Tea Light! Save with our bulk bags of No-Stick Wax Tarts - the longest lasting wax tarts on the market and best of all, they won't stick to your burner. Just let them harden and they slip right out. Use them over and over again - up to 3 days for most scents! A larger, longer lasting candle jar available in all of our standard true-to-life fragrances. Each jar is filled with our pure & natural, sustainable palm wax and tier one fragrance oils with two wicks for an extremely pretty glow. Choose from over 150 fragrances - view descriptions on our Master Fragrance List. You'll love our round and pudgy Glow Pots™ filled with natural SOY wax. Available in over 100 fragrances. Each is attractively labeled - perfect for gift giving! With shades of amber, gold and sage, this glass mosaic burner will offer a beautiful glow along with the lingering fragrance. (shown with matching tea light cup available through our candle holder catalog). We include a No-Stick Wax Tart in a fragrance of our choice and an unscented Premium Soy Tea Light for long lasting burn time - 7 hours or more! 5 3/4" high x 4 1/4" dia. Buy the Oyster Tea Candle Holder here for $6.95! One of my favorite times to purchase and burn candles is in the Fall! What perfect timing for the holiday season... I think buying candles for someone is an easy and affordable gift. 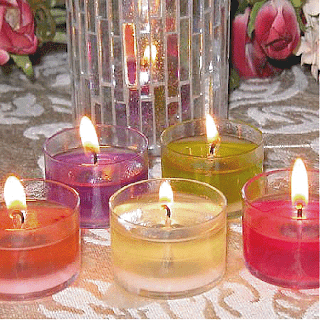 Country Light Candles are amazing, and I do not say that just because I am reviewing this company. I will be recommending this candle company to everyone. I am so excited to own my new tart burner. Anyone burn wax tarts?? They are super easy and Country Light Candle's wax tarts are strongly scented, just the way I like it! Antique Sandalwood *my favorite*, Strawberries & Champagne, Grassy Path, Witches Brew (perfect for Halloween!! ), Cashmere Woods, Rose Bouquet, Vanilla Buttercream, Gourmet Vanilla Bean, Caribbean Coconut, Magi, Lavender Sage Sachet and Vanilla Hazelnut! You must try them out!!! Their candles smell amazing, they are great quality, they have SO much to choose from, amazing customer service, fast shipping and the scents LAST. I cannot say enough good things about Country Light Candle Company! !